Adventures of an avid diver. Back in April.. yes I know, that’s how far behind I am. So. Back in April, my boss let me borrow his Nikon D7000 camera with Sea & Sea housing and dual YS-110a strobes for a day of diving on the wreck of the Olympic barge (San Pedro, just outside the harbor) and the Oil Rigs. This was my first time using a dSLR underwater and I was a bit nervous. The rig is huge compared even to my Olympus EPL1, which I feel is on the big side, but he has it set up so perfectly that once in the water its nice and neutral. I was impressed by the ease that I was able to use it, and especially with the speed at which it can focus and take pictures, that is definitely something you can’t beat with any smaller type of camera. However… for the first time using a dSLR AND using two strobes, I would not have picked two advanced, deep dive sites. I didn’t feel like I was able to really just relax and mess around with the camera, the Olympic sits at about 110ft and the rigs extend as deep as you’d like to go. He set me up with the Tokina 10-17 fisheye to practice wide angle, so there was another new thing added to the mix. I definitely had trouble keeping the strobes positioned far enough away and many of my pictures ended up with glare/ backscatter on the sides from the strobes. I also discovered upon importing my photos to my computer that just about every one of them was not really in focus. The dark, deep dives and the change from looking at an LCD to peering through a small viewfinder for the first time took its toll. Despite having some technical difficulties, the first dive was fantastic. The Olympic sits just outside the San Pedro Harbor in an area that is not known for good visibility. We descended not expecting much, but were surpised with nearly 40ft viz on the wreck. 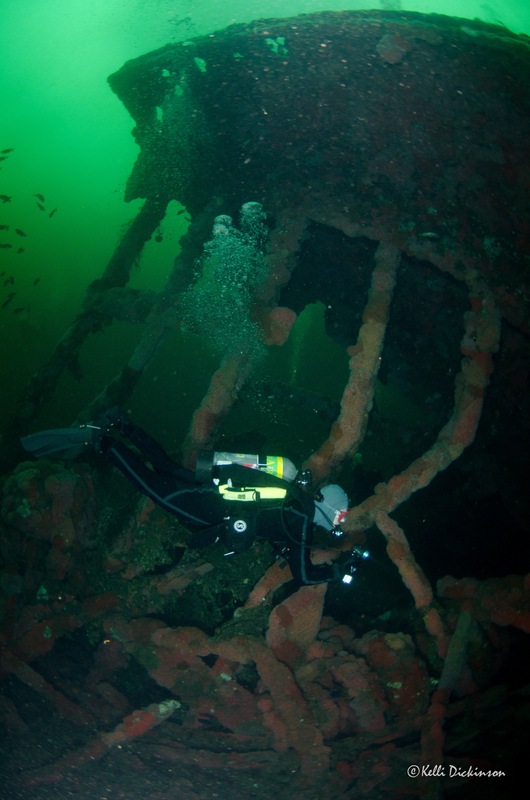 It was fantastic, and the Olympic is a large barge with some great columns still intact, overall a very cool dive site. After that we motored over to the oil rigs, the highlight of the trip, only to find a ripping current (which by the way is not fun with a large camera rig! ), and tons of stuff in the water mucking up with visibility. It was a pretty unanimous vote after that dive to head back and do a second dive off the wreck. The viz was not a good as dive #1, but still much better than the rigs, and no current. Overall I really liked using the dSLR, but would want my next attempt to be on a peaceful, easy, shallow dive. While I’ve been blabbing away here online, for the last two years, there is no one but myself to really look over or decide if my ramblings are worthwhile or just more mindless internet blabber. Not anymore! I have my first article up on another website. Its a short review of my test day with the new Olympus E-PM1 as I posted about back in March. I was able to test this camera and the Panasonic 8mm fisheye lens through Bluewater Photo, when we went out to Anacapa Island. I was asked to write a short article about using the camera and the lens underwater and share some of my photographs for the Underwater Photography Guide, which I did, and they just published it. It feels pretty cool to have my writing up on a “real” website… and the gal that posts the articles referred to me as a “Photographer” which makes me feel distinguished…even though I’m not really. Poke around some, the UWPG is a great website with tons of valuable information for underwater photographers! Want to receive email updates? Enter your email address to subscribe and receive notifications of new posts by email.